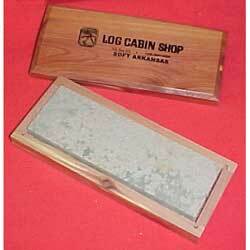 These natural Arkansas bench stones come mounted in handy cedar boxes. Ideal for sharpening all types of knives and chisels. Keep one close at hand for quick touch-up of your gun maker chisels. Quality stones at a competitive price. 6" Arkansas stone in hard No. 75209 or soft No. 75207.